Beck Began, Kolkata, August 10th 2015: Church leaders, priests and members of various churches such as Church of North India, Church of South India, Salvation Army, Mar Thoma, Presbyterian and Baptist observed a candle light vigil in front of the Bishop's College in Kolkata as part of the observance of the ‘Black Day’ demanding equal rights of Dalit Christians. This protest was jointly organised by the Commission on Dalits of NCCI, Bishop's College and various member churches of NCCI. The Christians of Dalit origin were denied Scheduled caste status by a Presidential order in 1950, which was signed on 10th August. 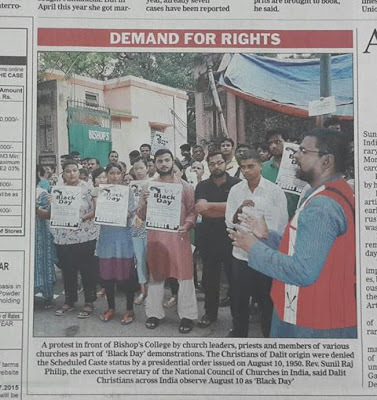 Rev Sunil Raj Philip, the Executive Secretary of the National Council of Churches in India (NCCI) informed that the Dalit Christians across India observe this day as the Black day under the auspices of the NCCI. Rev Dr Sunil M Caleb (principal, Bishop's College, Kolkata), Rev Philip Philip (Mar Thoma Church), Lieut Colonel Daniel Raju Dasari (National Secretary, Salvation Army), Major Babu Samraj (Executive Committee member, NCCI), Rev. Papiya Durairaj and J. Goldwin (Student leader) addressed the gathering. The student community of Bishop's College in Kolkata, Priests from various denominations and the leaders of the National Secretariat of the Salvation Army participated in the protest meet. Those who were in protest sang songs, raised slogans and held candles in demand of 'de-linking religion from caste- based reservation'. The protesters pointed out that though the order initially suggested, "No person who professes a religion other than Hinduism shall be deemed to be a member of the Scheduled Caste”, by a later amendment Sikhs (1956) and Buddhists (1990) were included in the Scheduled Caste net. Hence keeping the Dalit Christians from the fold of Scheduled caste list is seen as an injustice. An oath taken by the participants of the participants it was affirmed that as the Christian community they will stand united to continue the demand for equal justice for the Dalit Christians and Dalit Muslims. The protesters demanded the immediate intervention of the Central government to repeal the infamous Presidential Order and extend the Scheduled Caste status to the Christians and Muslims of Dalit origin. They also demanded that the government should end the procrastination of replying the queries of the Supreme Court on this issue and give an answer favourable to the Dalit Christians and Dalit Muslims respecting the fact that twelve state governments, the National Minority Commission and National Commission for Scheduled Caste (NCSC) have already given written support for the inclusion of these vulnerable communities in the SC list. The print media supported the observance of Black day in Kolkata by carrying the news item. 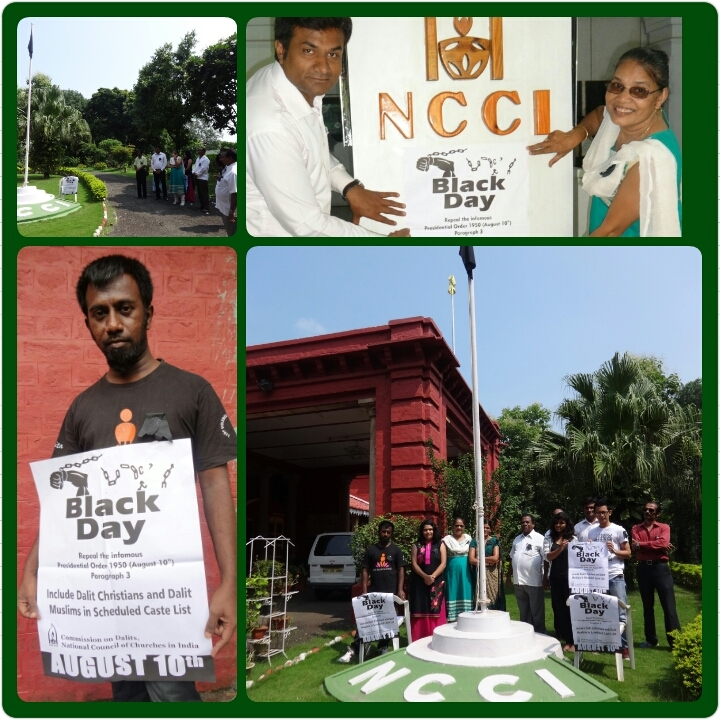 The National Council of Churches in India (NCCI) office in Nagpur observed ‘Black Day’ on the 10th of August 2015, in silent protest against the Presidential Order 1950 which does not include Dalit Christians and Dalit Muslims in Schedule Caste List. To mark this occasion, a black flag was hoisted outside the main office building and a black ribbon was worn by everyone.